A number of burger chains have popped up around Boston and around the country doing a healthy, tastier version of fast food. Four Burgers has quickly become one of my favorites. This small company has two locations: one on Boylston Street in the Theatre District, and one in Central Square. I recommend both. UPDATE: Sadly, the Boylston Street location in the Theatre District has closed. But the Central Square location is still open! Tuesday, October 30, 2012. My boyfriend had wanted to try Four Burgers for a while. I knew nothing about it, but I’ve been on a bit of a burger crawl around Boston so I was game. 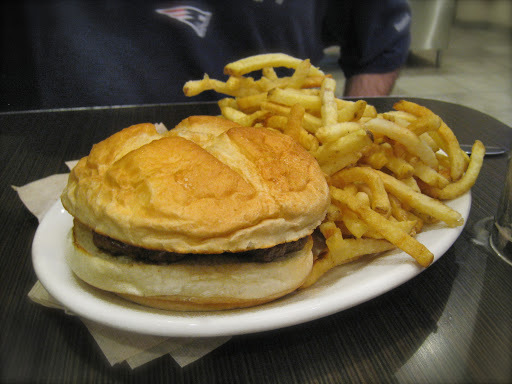 We made the half-hour walk from the Northeastern campus to Four Burger’s Boylston Street location on the day after Hurricane Sandy wreaked havoc along the East Coast. Boston had been lucky to avoid most of Sandy’s destruction. 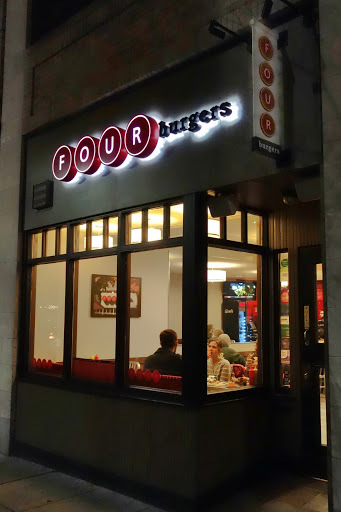 Four Burger’s Boylston Street location in Boston’s Theatre District. As is his habit, my boyfriend ordered a plain burger and bun ($7.75), sans “extras.” He’s a purist. I’ve written about this before. Short version, he liked the burger. Plain burger-and-bun with a side of french fries. He also ordered a side of fries which I stole from him one-by-one, seagull style. As you can see from the photo, for $1.50 you get more than your money’s worth with the “small” size. These were good fries, too: thin, crispy, salty, some with the potato skins still on (which I like). 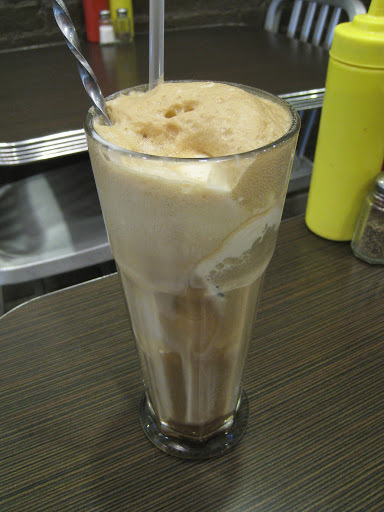 Usually I don’t drink anything but ice water when dining out, but this time I splurged on a root beer float ($4). It was as yummy as I had hoped! I love Thanksgiving burgers and sandwiches, so as soon as I saw the menu I lasered onto Four Burger’s Thanksgiving sandwich. 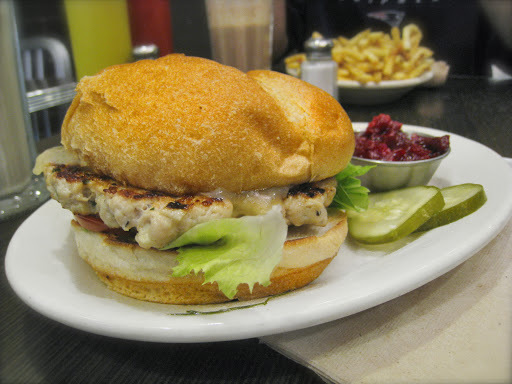 The spiced Koch turkey burger ($7.75) was served with lettuce, tomato, pickles, and cranberry apple chutney on the side. I added some Vermont cheddar cheese (+$.50). As I finished this deliciousness, I decided that I would like to return to Four Burgers as soon as possible. Turkey burger with cheddar, tomato, lettuce, pickles, and a side of cranberry-apple chutney. Friday, November 9, 2012. And so just about a week later, that’s exactly what I did. A friend was playing a show at the Middle East, and I was surfing Urbanspoon for possible beforehand dinner options. I saw Four Burgers and that sealed my decision. 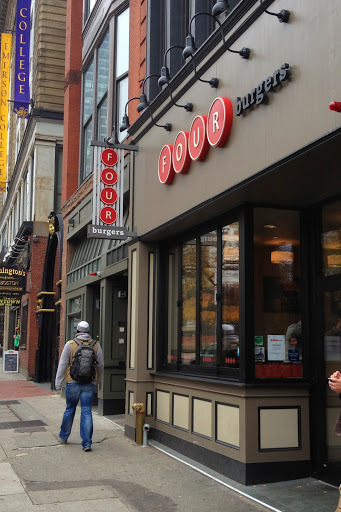 Four Burger’s Mass Ave location in Cambridge’s Central Square. Central Square + Friday + 8pm = crowded. Luckily, we managed to find a table nevertheless. Although I was tempted by the lamb burger special with cucumbers and feta cheese, I ordered the Niman Ranch hot dog ($4.50). I am not particularly a hot-dog fan. I eat them at home occasionally but had never ordered one at a restaurant. I am picky, dare I say temperamental, about them. I was a vegetarian for years so I still find it hard to wrap my mind around the idea of eating this particular processed-meat product, but I have to admit, I was sold by the marketing. Niman Ranch raises and supplies the ham for my world-favorite sandwich, the Vietnamese ham sandwich at A&J King Artisan Baker in Salem. I cannot stress enough how much I love when restaurants advertise to me where they source their ingredients from. I could care less about the calorie count or fat content of a dish; there are enough people on enough varying diets that it seems silly to boil-down what’s in a dish to those two factors. But if you tell me where you’re sourcing your ingredients, suddenly you have my attention. Verrill Farms strawberries, you say? Woodbury clams? Niman Ranch hot dogs? That’s some useful information. 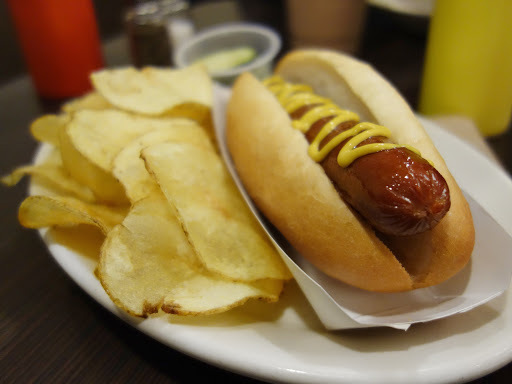 Niman Ranch hot dog with a side of house made potato chips. So I ordered this Niman Ranch hot dog plain with pickles on the side. The attempt at the artsy mustard squiggle in the photo was my own addition. The hot dog casing was very shiny, and the meat inside was very dark. And hey, maybe this is me just fulfilling my own prediction of what a Niman Ranch hot dog should be, but the taste of this hot dog just radiated quality. I felt none of the “but should I really be eating this?” ambivalence that I sometimes do when consuming a hot dog. This was just good. I also got a side order of potato chips (regular, not sweet potato). The chips had that thin, slightly-oiled house made potato chip texture. I can understand why some people might object to a noticeable taste of oil, but I loved these. It wasn’t greasy, you understand, but a natural and unadulterated oil. Maybe the best description of these is a “potato chip version” of the fries. Thursday, November 15, 2012. After those two experiences, I was eager to return to Four Burgers. I was attending an industry event near Four Burger’s Boylston Street location, so I jumped at the opportunity to try it again. It was a long morning beforehand: I woke up early to register for my spring classes, took an exam, put on a suit, and hopped a train to Boylston. Four Burgers was a deserved reward. 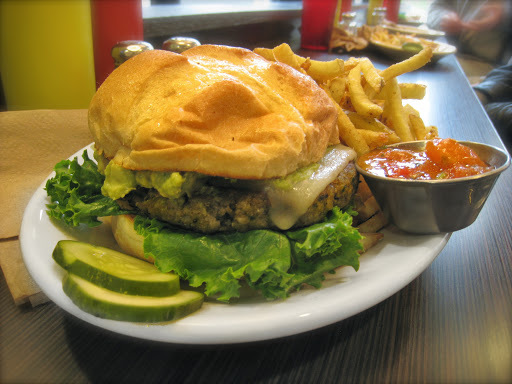 For my third experience at Four Burgers, I decided to try my first-ever veggie burger. No, I had never eaten a veggie burger before, and yes, during my aforementioned “vegetarian” stint, I was the weirdest vegetable-fearing vegetarian ever. The Four Burgers black bean veggie burger ($7.50) comes with either (1) guacamole, lettuce, and salsa, or (2) lettuce, tomato, and tangy mango barbecue sauce. Unable to decide, I asked the cashier for his personal preference, and he recommended the guacamole and salsa. I added pepper jack cheese (+$.50), and a few slices of pickles came on the side. Black bean veggie burger with guacamole, lettuce, pepper jack cheese, salsa, pickles, and a side of french fries. The texture of the veggie burger was softer than normal hamburg meat. The burger was a little spicy, and the pickles complemented this well. The salsa had very large chunks of tomato and was quite mild. I am so glad that Four Burgers was my introduction to veggie burgers. No offense to anybody, but I suspect this would have been superior to Northeastern’s International Village dining hall. One final note about my experiences at Four Burgers: You know how every now and then, you will have a short interaction with someone and just instinctively recognize that they are kind, warm, and friendly to everybody? I got that vibe from every single Four Burgers employee I have spoken with. It wasn’t just “customer service” friendliness, but genuine warmth. And when genuine warmth appears to be the standard for every employee of a company, that reflects pretty good things about the company’s business practices. Go Four Burgers! Enter your email address to follow The Girl Who Ate Boston and receive notifications of new posts by email.